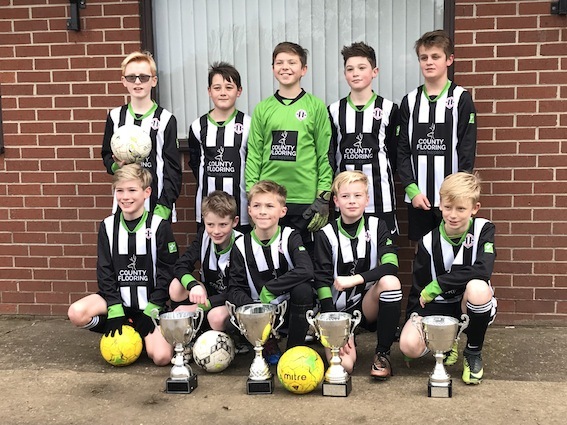 Southwell City Whites are looking to recruit new players to join their U12 football team in the new year. The boys currently play 9-a-side matches in the Young Elizabethan League every Sunday and are now looking to grow the squad as they will be moving to 11-a-side games next Summer. Manager Paul Sharpe has always run the team using a small number of players. This has allowed him to offer maximum playing time to all the boys in the squad. This philosophy has seen him develop a well has run team that been very successful. In the last two years, they have won two league titles and one league cup! The boys are pictured wearing a new kit for this season, which has been kindly provided by County Flooring & Supplies Ltd.